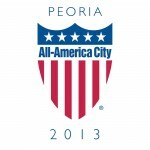 (Peoria, IL) The city of Peoria will host the Great American Cleanup on Saturday, April 27th. This national event encourages local organizations and neighborhoods to engage in public space cleanups and beautification projects. The Community Development Department will supply dumpsters and volunteers to enhance neighborhood cleanup efforts during the event. While it is important to maintain clean and healthy neighborhoods year-round, this nationwide cleanup effort is a wonderful opportunity for the City to partner with neighborhood associations to make a lasting impact. Picking up trash is a simple way to appreciate our neighborhoods and gives residents the opportunity to appreciate Peoria. The national organization Keep America Beautiful encourages all participants to use the hashtags #cleanYOURblock and #DoBeautifulThings when posting on social media, so that the work of our residents can be shared with other participants nationwide. A limited number of dumpsters will be available for the event and will be assigned on a first come, first served basis. If all dumpsters have been allocated, then your Neighborhood Association can request a dumpster for an alternative date later in the year. To request a dumpster for your neighborhood cleanup, please visit www.peoriagov.org and complete an application. Completed applications should be emailed to Neighborhood Enhancement Coordinator, Josiah Williams, at jdwilliams@peoriagov.org. Events sponsored by Keep Peoria Beautiful on April 27 include a recycling spot for electronics and batteries at Glen Oak Learning Center, 2100 N., Wisconsin Ave. from 9 a.m.-12 p.m. and tire collection (up to 10 tires, for Peoria residents only) at Jimax, 2000 W. Clark Street (rules apply for tire dropoff).